1. 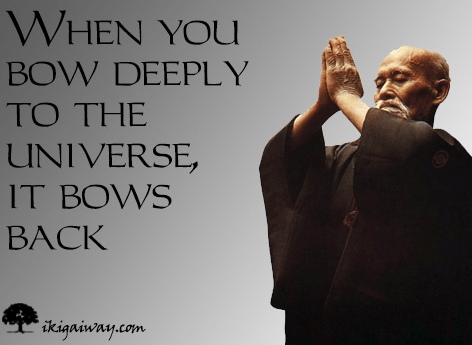 When entering and leaving the dojo, students bow in the direction of Morihei Ueshiba’s picture on the altar (kamiza). This is a tradition of showing respect to the Founder of Aikido. 2. Shoes are to be removed and placed neatly in a row, or on shoe shelves if they are present. 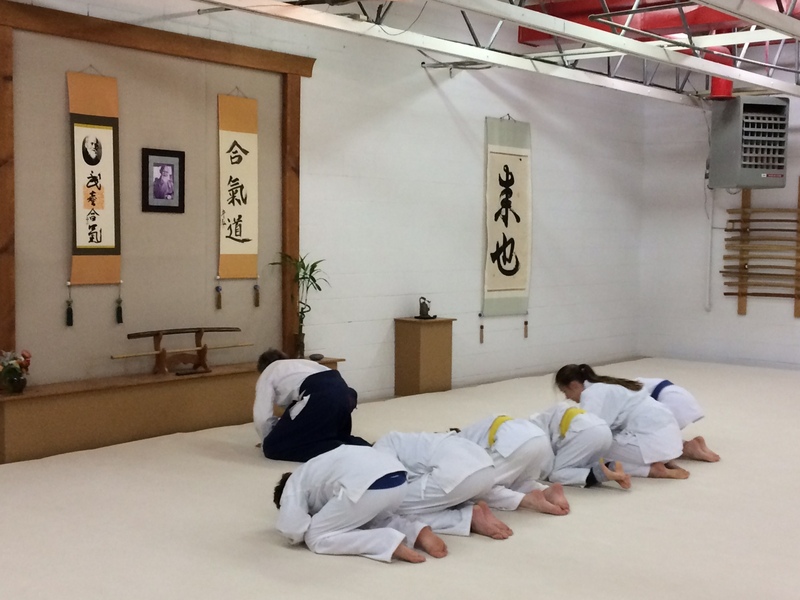 When approaching the mat, students bow respectfully to the kamiza. 3. Students should assemble quietly at least five minutes before the class is scheduled to start. It is recommended that all students kneel (sit seiza) in mediation and await the instructor’s arrival on the mat. Meditation calms the mind, and it is desirable that everyone, students and spectators alike, in the dojo be silent during meditation. 4. 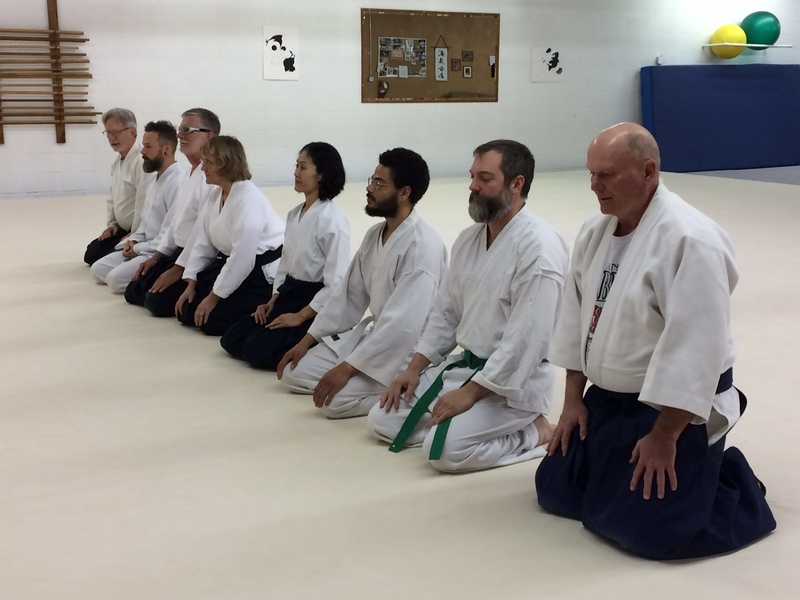 When the instructor comes onto the mat, she/he and the students bow to O-Sensei’s picture. The students then bow to the instructor, formally opening the class. 5. It is proper to ask the instructor for permission to practice when arriving late for class, or for permission to leave early. 6. Students should never sit on the mat with their backs to the kamiza, nor should they pass between the instructor and the kamiza. 7. When approaching the instructor on the mat, whether you are asked or called, you bow first and at the end. 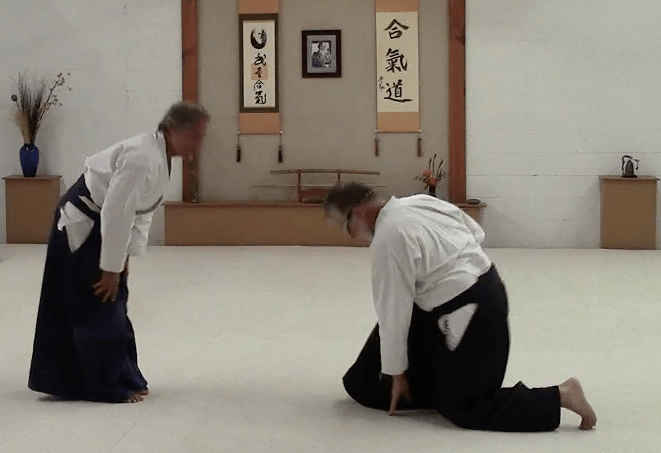 Never yell out “Sensei” and/or beckon for instruction – go up to him or her and bow. 8. 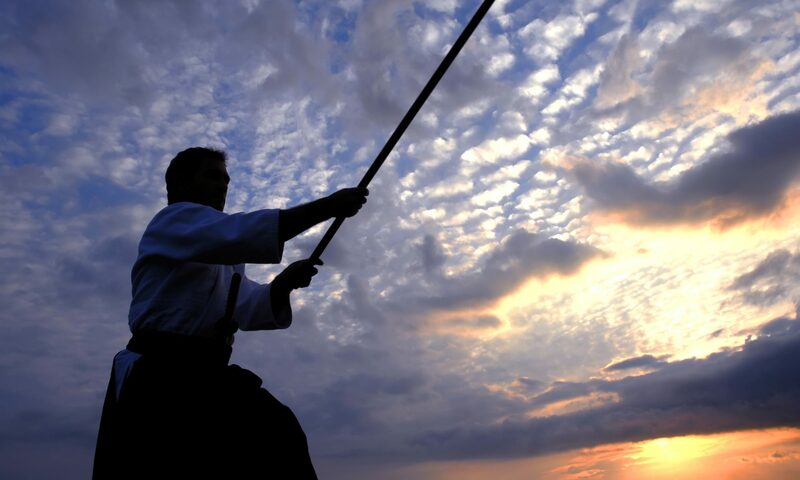 Once engaged in the practice of Aikido, clear your mind of everything but the lessons given and the principles of Aikido. Practice with unity of mind and body. 10. When the instructor is teaching a couple, it is not necessary for others to sit down and watch unless instructed to. It is preferable to keep practicing. 11. Your partner is not an opponent. Techniques are learned through him/her and with him/her. It should be a pleasure to be thrown as well as to throw. Each movement in Aikido teaches the principles and spirit of Aikido and should be practiced sincerely. 12. When changing partners during class, you should acknowledge both the partner you are leaving as well as your new partner with a bow. 13. Care should be taken to be aware of the ability of your partner so that no injuries occur. 14. At the end of class, the instructor and students bow to O-Sensei’s picture, then the students bow to the instructor and to each other. 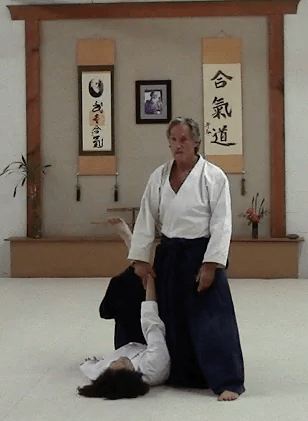 Students should wait until the instructor has left the mat before getting up from seiza. 15. Students are responsible for cleanliness of their Dojo. 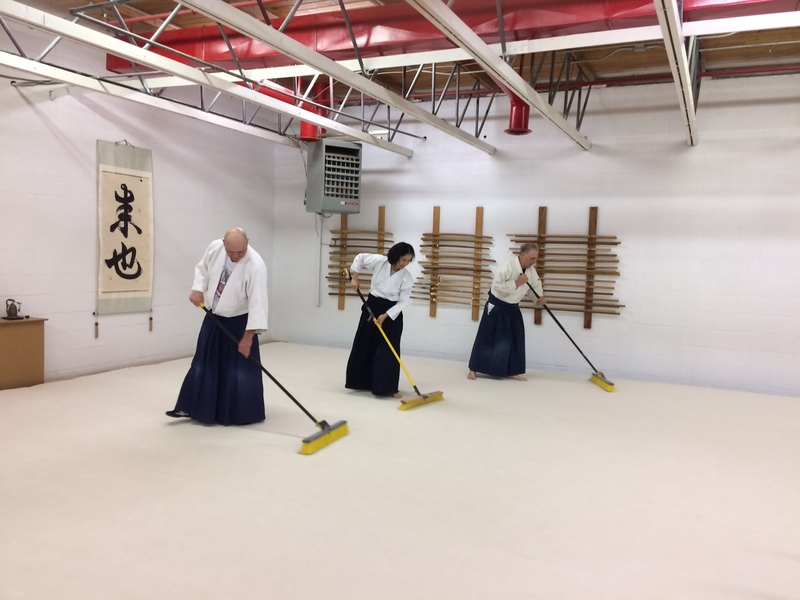 At the end of class, sweep the mat and dust the floors. At least weekly, vacuum the mat, dust the Shomen, pictures and other surface areas, empty garbage cans and clean the rest room. 16. A few DON’TS – Do not: lie on the mat, lean against the walls, sit with your legs stretched out, wear rings or watches, chew gum, have long finger or toenails, wear dirty or torn uniforms, leave the mat for water (except on hot days), etc. 17. Keep in mind that Dojo refers not only to the mat, but to the entire area inside the building. Practicing Dojo etiquette pertains to all areas in the building. 18. When observing class, spectators should remain quiet out of respect for the instructor and practicing students. 19. Sensei will approach you when it is time for your next kyu or dan examination. If you feel you are ready for an exam it is not appropriate to approach Sensei directily. Rather discuss the possibility with senior students with whom you study in preparation for you exam.